Last year I developed a graph visualization for my colleges from YProductions. 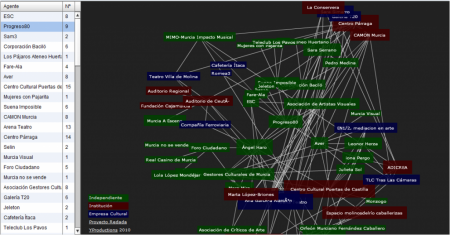 Since then they used it for their projects of mapping cultural agents in different cities like Alicante and Murcia. Now we published the sources of the flex project on Github under GPLv3 license. The code is written in Actionscript3 based on flare library. Data is read from an external GraphML file so if you want to publish your own graph just create an XML file based on your own data. You can find more information on the wiki. Últimamente estuve montando algunas páginas web basadas en WordPress. Con la publicación de la rama 3, WordPress mejoró mucho la base del código y para proyectos sencillos prefiere este CMS a otros más potentes como Drupal. 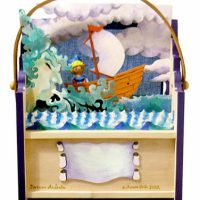 festivAnima diseña, produce y comercializa fantásticos teatros en miniatura. Stiliana Mitzeva hizo el diseño tan guapo. A Ricardo Iglesias ayudé a migrar su blog y por fin se puede ver sus últimos proyectos como Surveillance Cameras: they are alive!!! YProducciones sigue con su proyecto redada, la última hicieron en Murcia bajo el nombre de Capital Reactiva. Utilicé el fantástico Pods CMS para añadir un backoffice al grafo de agentes culturales independientes. After using prefuse library and Processing for graph visualization a new project gave me the chance to try flare, the translation of prefuse to Actionscript. My colleges from YProductions are investigating who are the principal persons, collectives and institutions in Alicante cultural live. 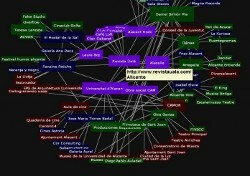 The project is called redada and I made a social graph (lightweight version) of their results of investigation. First impressions: Good API design and quite stable for a alpha release. There are still some improvements to be made in my application but if you want to make your own experiments you can start with this basic example, download Flex Project here.